We have finished audit of the scorecard of our client, we are now sharing some advise, that others might take into account in order to improve their Balanced Scorecards. Balanced Scorecard focused on customer requirements. Problem found: In the perspective “Internal Processes Perspective” there are 18 indicators, it is obvious that this category is overloaded. 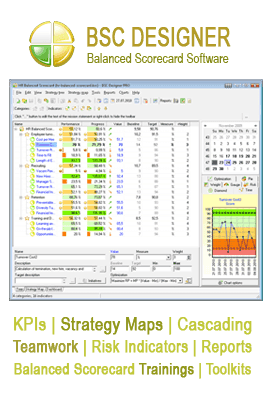 Possible solution: regroup KPIs, consider creating sub categories and placing KPIs there, we suggest adding about 4-5 sub categories or removing less important indicators. Problem found: There are many indicators with weight 1. This is a sign that the Balanced Scorecard is not “balanced”. Possible solution: check out the advice above, regrouping indicator will give you better understanding of what indicators are actually more important. Problem found: no description for KPIs. Possible solution: having no description for KPIs might make difficult for other members of your team understanding the scorecard. Problem found: some KPIs have the value less than the minimum possible value as a result you can see negative performance that doesn’t make sense. Possible solution: change the minimum value to some reasonable minimum value, use baseline to show the starting value. Check out the relevant information about making audit of the Balanced Scorecard in the eTraining: Testing the Balanced Scorecard. We have finished audit of your scorecard, please find below some advise, that you might take into account in order to improve your Balanced Scorecard.